It was supposed to be temporary. 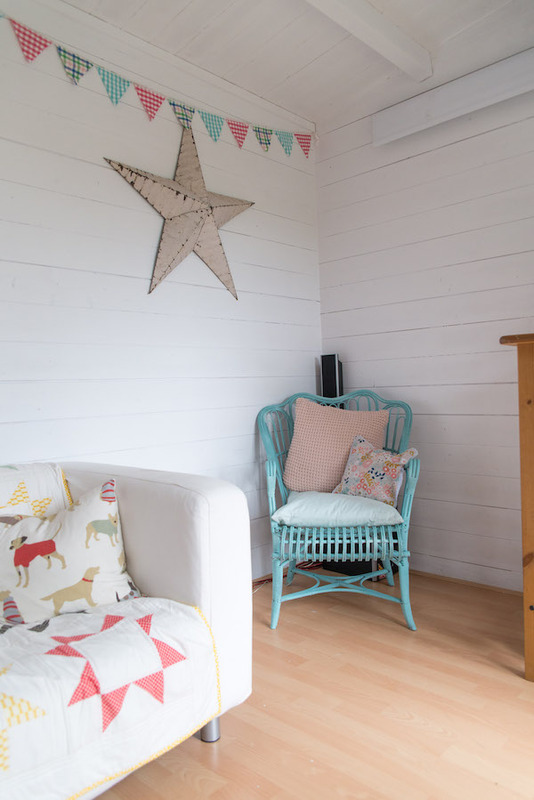 Clare Mansell and her husband needed a spare room while renovating their home in West Sussex. But the kit shed they purchased in a hurry ended up being an important part of Clare’s life in its afterlife as a quilting/sewing she shed. 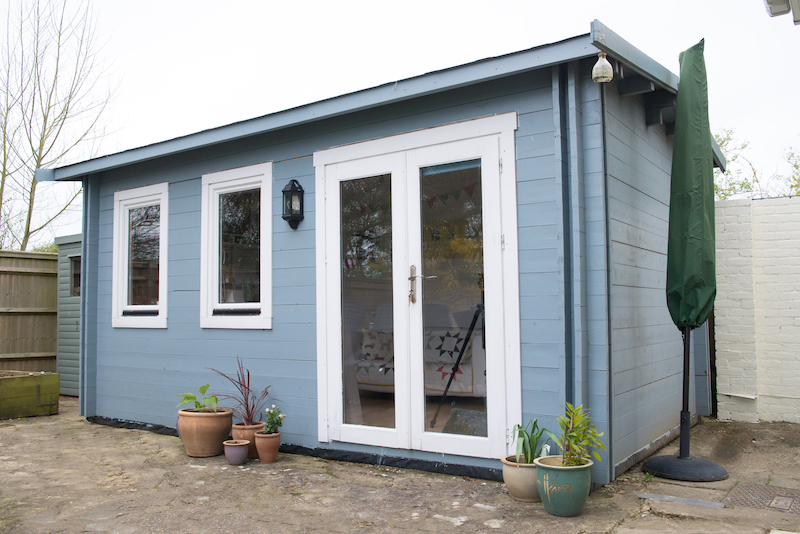 Although somewhat plain on the outside, the shed is clean and tidy, painted a soft blue with off-white trim. Very shipshape. The object wasn’t for fancy, or for the price tag that fancy often comes with. After all it was going to be for something temporary. Yet as Clare looked around the kitchen, strewn with her large sewing machine and bins of fabrics, she began to look at the structure with new eyes. Once the renovation of their home was complete, the Mansells gleefully moved Clare’s cottage industry into the cottage. Keeping with the clean theme, the interior feels spacious and organized. 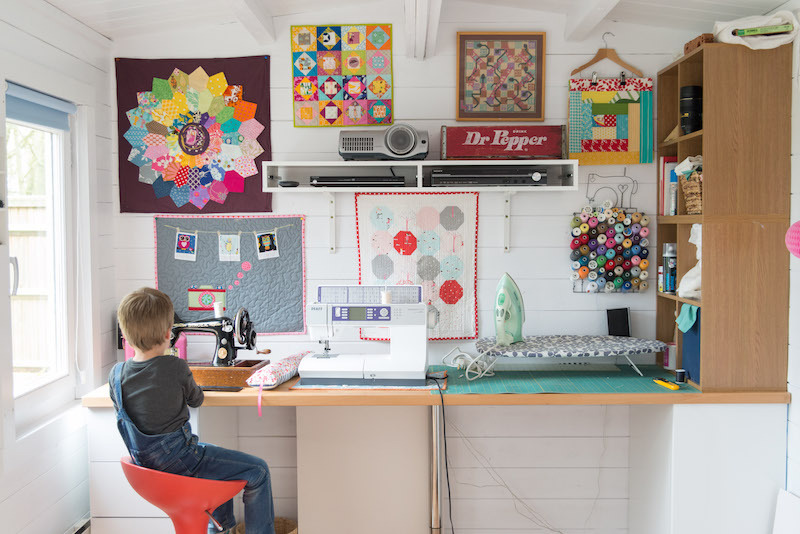 After enduring a kitchen table industry, with all of the chaos and hassle of constantly stuffing things in boxes and cabinets, you can imagine the joy of having dedicated space … and wanting to keep it nice. 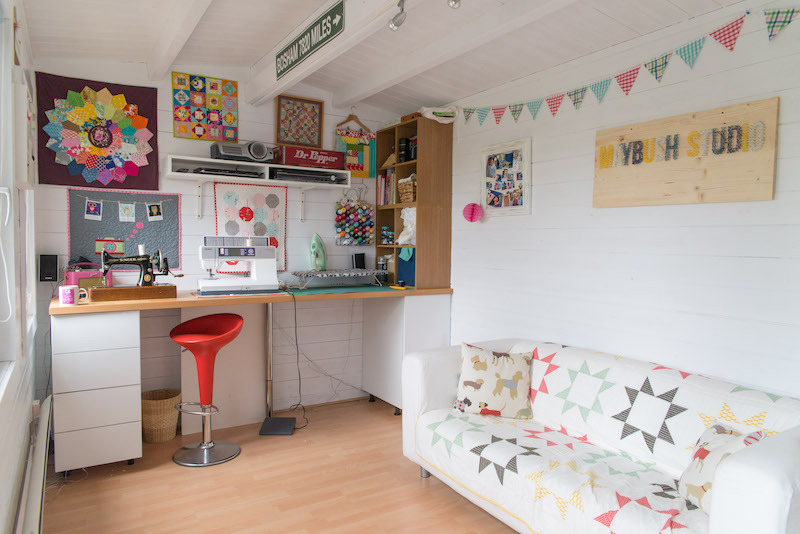 Clare set up a clever workspace using a worktop slab outfitted with inexpensive cubby and drawer units. The sleek couch was a $30 steal on eBay. Remember: Someone’s always trying to unload one sofa or another; you should almost never have to pay full price. Clare included lots of shelf space for her collection of books. If you look real close, you’ll note the drop-down screen for movies and such. Get to know Clare and all of her creative pursuits as a mom, photographer, marketing personality (she works with brands and does product reviews on YouTube) at her website Maybush Studio and YouTube channel.